Much has been written about engaging international students in their new campus environments. However, there is still a gap between literature and practice in terms of such students’ initial experiences. A systematic review of 48 studies published between 2007 and 2018 was conducted to locate the research gaps, examine how and in what areas international undergraduate students are being encouraged to participate, and their unique experiences with the process. The findings show that few studies focused solely on international undergraduates. Their engagement varied depending on the student’s background, major, region, and type of institution. These students faced unique and uneven experiences with social support, academics, community identity, connectedness, and perceived discrimination. Implications for higher education administrators, international students, and researchers suggested. Ashwin, P., & McVitty, D. (2015). The meanings of student engagement: implications for policies and practices. In A. Curaj, L. Matei, R. Pricopie, J. Salmi, & P. Scott (Eds. ), The European higher education area (pp. 343–359). New York: Springer Open. Bista, K. (2015). Asian international students’ college experience: Relationship between quality of personal contact and gains in learning. Journal of International and Global Studies Volume, 6(2), 39.
de Araujo, A. A. (2011). Adjustment issues of international students enrolled in American colleges and universities: A review of the literature. Higher Education Studies, 1, 2–8. Durden, W. G. (2016, January 11). No longer bystanders. Inside Higher Ed. Retrieved from https://www.insidehighered.com/views/2016/01/11/colleges-must-provide-more-attention-international-students-demands-essay. Eldaba, A. (2016). An innovative model to design an academic and social development program for international college students. College Student Journal, 50(2), 171–178. Geary, D. (2016). How do we get people to interact? International students and the American experience. Journal of International Students, 6(2), 527. Glass, C. R., & Gesing, P. (2018). The development of social capital through international students’ involvement in campus organizations. Journal of International Students, 8(3), 1274–1292. Glass, C. R., Kociolek, E., Wongtrirat, R., Lynch, R. J., & Cong, S. (2015). Uneven experiences: The impact of student-faculty interactions on international students’ sense of belonging. Journal of International Students, 5(4), 353–367. Hsieh, M. H. (2007). Challenges for international students in higher education: One student's narrated story of invisibility and struggle. College Student Journal, 41(2), 379–391. Kenyon, K., Frohard-Dourlent, H., & Roth, W. D. (2012). Falling between the cracks: Ambiguities of international student status in Canada. Revue Canadienne d’Enseignement Supérieur, 42(1), 1–24. Korobova, N., & Starobin, S. S. (2015). 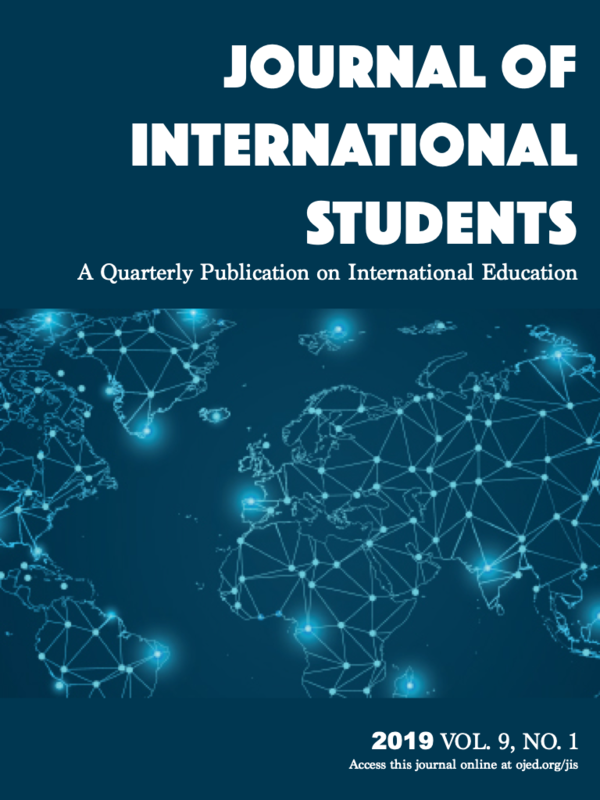 A comparative study of student engagement, satisfaction, and academic success among international and American students. Journal of International Students, 5(1), 72–85. Özturgut, O., & Murphy, C. (2009). Literature vs. practice: challenges for international students in the US. International Journal of Teaching and Learning in Higher Education, 22(3), 374–385. Poyrazli, S., & Grahame, K. M. (2007). Barriers to adjustment: Needs of international students within a semi-urban campus community. Journal of Instructional Psychology, 34(1), 28–46. Siczek, M. M. (2015). Developing global competency in US higher education: Contributions of International Students. CATESOL Journal, 27(2), 5–21. Telbis, N. M., Helgeson, L., & Kingsbury, C. (2014). International students’ confidence and academic success. Journal of International Students, 4(4), 330–341. Tsevi, L. (2018). Survival strategies of international undergraduate students at a public research midwestern university in the United States: A case study. Journal of International Students, 8(2)1034–1058. Van Horne, S., Lin, S., Anson, M., & Jacobson, W. (2018). Engagement, satisfaction, and belonging of international undergraduates at US research universities. Journal of International Students, 8(1), 351-374. Doi:10.5281/zenodo.1134313.